Twolayer Blown Film Machinehas a better balance of mechanical properties than cast or extruded films because it is drawn in both the transverse and machine directions. Mechanical properties of the thin film include tensile and flexural strength, and toughness. The nearly uniform properties in both directions allow for maximum toughness in the film. Blown film extrusion can be used to make one large film, two smaller ones, or tubes that can be made into bags. Also, one die can make many different widths and sizes without significant trimming. This high level of flexibility in the process leads to less scrap material and higher productivity. Blown films also require lower melting temperatures than cast extrusion. Measured at the die opening, the temperature of cast film is about 220°C., where as the temperature of blown film is about 135°C. Furthermore, the cost of the equipment is approximately 50% of a line. Consumer food wrap from plastic wrap article. Research has been done to explore the incorporation of blown film extrusion into the large-scale manufacturing of carbon nanotube and nanowire films. We are a leading Manufacturer & Exporter of Extrusion Coating Lamination Plant such as Extrusion Coating Lamination Machine, BOPP La Extrusion coating & laminating process. The actual process of extrusion coating involves extruding resin from a slot die at temperatures up to 320°C directly onto the moving web which may then passed through a nip consisting of a rubber covered pressure roller and a chrome plated cooling roll. The latter cools the molten film back into the solid state and also imparts the desired finish to the plastic surface. The web is normally run much faster than the speed at which the resin is extruded from the die, creating a coating thickness which is in proportion to the speed ratio and the slot gap. Twolayer Blown Film Line in India is a similar process except that the extruded hot molten resin acts as the bonding medium to a second web of material. Twolayer Blown Film Line in India are usually custom-built and can be configured for a variety of applications including liquid packaging, aseptic drink containers, flexible packaging, toothpaste tubes, medical packaging, industrial wraps, insulation backed materials, and plastic coated tablecloths, as well as sacks for products as diverse as cement, cereal grain, and dry chemicals. Twolayer Blown Film Line in India deliver a combined substrate, the component elements of which would be very difficult to separate. The combined substrate inherits highly enhanced physical properties and barrier protection performance from its component elements. In the extrusion coating process an extruder forces melted thermoplastic resin through a horizontal slot-die onto a moving web of substrate. The resulting product is a permanently coated web structure. Extrusion lamination is a similar process to extrusion coating, where the resin is extruded between two substrates and acts as a bonding agent. Inside an Twolayer Blown Film Line in India the substrates and melt are nipped at a bonding station. This consists of a large roll, a pressure roll, and a counter-pressure roll cooled by water. The combination of the pressure between the rolls and the temperature permits delivery of the correct adhesion level. The final product is rewound as a permanently bonded multi-ply laminated structure. Most plastic films and foils require a primer coating before they are used in the extrusion process. We are a leading Manufacturer & Twolayer Blown Film Machine Manufacturer in India such as Extrusion Coating Lamination Machine, BOPP La Extrusion coating & laminating process. Twolayer Blown Film Machine Manufacturer in India is a similar process except that the extruded hot molten resin acts as the bonding medium to a second web of material. Twolayer Blown Film Machine Manufacturer in India are usually custom-built and can be configured for a variety of applications including liquid packaging, aseptic drink containers, flexible packaging, toothpaste tubes, medical packaging, industrial wraps, insulation backed materials, and plastic coated tablecloths, as well as sacks for products as diverse as cement, cereal grain, and dry chemicals. Twolayer Blown Film Machine Manufacturer in India deliver a combined substrate, the component elements of which would be very difficult to separate. The combined substrate inherits highly enhanced physical properties and barrier protection performance from its component elements. Inside an extrusion coating and laminating line the substrates and melt are nipped at a bonding station. This consists of a large roll, a pressure roll, and a counter-pressure roll cooled by water. The combination of the pressure between the rolls and the temperature permits delivery of the correct adhesion level. Blown Film Plant is a similar process except that the extruded hot molten resin acts as the bonding medium to a second web of material. Blown Film Plant are usually custom-built and can be configured for a variety of applications including liquid packaging, aseptic drink containers, flexible packaging, toothpaste tubes, medical packaging, industrial wraps, insulation backed materials, and plastic coated tablecloths, as well as sacks for products as diverse as cement, cereal grain, and dry chemicals. Blown Film Plant deliver a combined substrate, the component elements of which would be very difficult to separate. The combined substrate inherits highly enhanced physical properties and barrier protection performance from its component elements. In the Blown Film Plant process an extruder forces melted thermoplastic resin through a horizontal slot-die onto a moving web of substrate. The resulting product is a permanently coated web structure. Extrusion lamination is a similar process to extrusion coating, where the resin is extruded between two substrates and acts as a bonding agent. Inside an Blown Film Plant the substrates and melt are nipped at a bonding station. This consists of a large roll, a pressure roll, and a counter-pressure roll cooled by water. The combination of the pressure between the rolls and the temperature permits delivery of the correct adhesion level. Two Layer ABA Die Blown Film Extrusion Lines with the best combination of technology and performance. These low investment, power efficient, high - speed plants can give processors the competitive edge and quick return on their investment. Twolayer Blown Film Extrusion Machine has a great demand in global market for its wide range of packaging products that can be produced from it. Two layer ABA Die blown film machine is an economical solution to create moderate barrier films for shopping bags, crop covers, carry bags used in textile sector, etc. It consumers low power and when it comes to return on investment, packaging industry can made good and fast profit. Similarly, two layer blown film line materials can also be produced from this single plant. Twolayer Blown Film Plant with the best combination of technology and performance. These low investment, power efficient, high - speed plants can give processors the competitive edge and quick return on their investment. Twolayer Blown Film Plant has a great demand in global market for its wide range of packaging products that can be produced from it. Two layer ABA Die blown film machine is an economical solution to create moderate barrier films for shopping bags, crop covers, carry bags used in textile sector, etc. It consumers low power and when it comes to return on investment, packaging industry can made good and fast profit. Similarly, two layer blown film line materials can also be produced from this single plant. Twolayer Blown Film Plant with the best combination of technology and performance. These low investment, power efficient, high - speed plants can give processors the competitive edge and quick return on their investment. Twolayer Blown Film Plant has a great demand in global market for its wide range of packaging products that can be produced from it. Twolayer Blown Film Plant is an economical solution to create moderate barrier films for shopping bags, crop covers, carry bags used in textile sector, etc. produced from this single plant. Twolayer Blown Film Machine with the best combination of technology and performance. These low investment, power efficient, high - speed plants can give processors the competitive edge and quick return on their investment. Two layer blown film Line has a great demand in global market for its wide range of packaging products that can be produced from it. Two layer blown film machine is an economical solution to create moderate barrier films for shopping bags, crop covers, carry bags used in textile sector, etc. It consumers low power and when it comes to return on investment, packaging industry can made good and fast profit. Similarly, two layer blown film line materials can also be produced from this single plant. with the best combination of technology and performance. These low investment, power efficient, high - speed plants can give processors the competitive edge and quick return on their investment. Twolayer Blown Film Machine in India with the best combination of technology and performance. These low investment, power efficient, high - speed plants can give processors the competitive edge and quick return on their investment. Twolayer Blown Film Machine in India has a great demand in global market for its wide range of packaging products that can be produced from it. 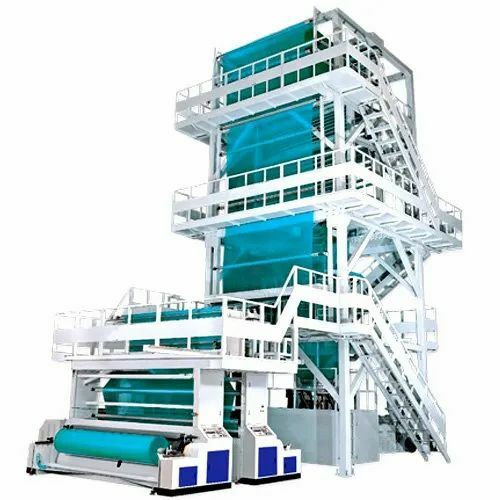 Two layer ABA Die blown film machine is an economical solution to create moderate barrier films for shopping bags, crop covers, carry bags used in textile sector, etc. It consumers low power and when it comes to return on investment, packaging industry can made good and fast profit. Similarly, two layer blown film line materials can also be produced from this single plant. Twolayer Blown Film Machine Manufacturer with the best combination of technology and performance. These low investment, power efficient, high - speed plants can give processors the competitive edge and quick return on their investment. Twolayer Blown Film Machine Manufacturer has a great demand in global market for its wide range of packaging products that can be produced from it. 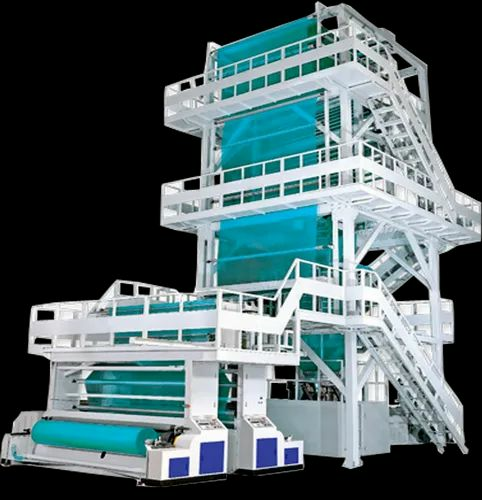 Two layer ABA Die blown film machine is an economical solution to create moderate barrier films for shopping bags, crop covers, carry bags used in textile sector, etc. It consumers low power and when it comes to return on investment, packaging industry can made good and fast profit. Similarly, two layer blown film line materials can also be produced from this single plant. Twolayer Blown Film Machine Manufacturer with the best combination of technology and performance. These low investment, power efficient, high - speed plants can give processors the competitive edge and quick return on their investment. Two layer ABA Die Film Making Machine has a great demand in global market for its wide range of packaging products that can be produced from it. Two layer ABA Die Film Making Machine is an economical solution to create moderate barrier films for shopping bags, crop covers, carry bags used in textile sector, etc. Twolayer Blown Film Plant in India with the best combination of technology and performance. These low investment, power efficient, high - speed plants can give processors the competitive edge and quick return on their investment. Two layer ABA Die blown film Line has a great demand in global market for its wide range of packaging products that can be produced from it. Two layer ABA Die blown film machine is an economical solution to create moderate barrier films for shopping bags, crop covers, carry bags used in textile sector, etc. It consumers low power and when it comes to return on investment, packaging industry can made good and fast profit. Similarly, two layer blown film line materials can also be produced from this single plant. Twolayer Extrusion Blown Film Machine with the best combination of technology and performance. These low investment, power efficient, high - speed plants can give processors the competitive edge and quick return on their investment. Twolayer Extrusion Blown Film Machine has a great demand in global market for its wide range of packaging products that can be produced from it. 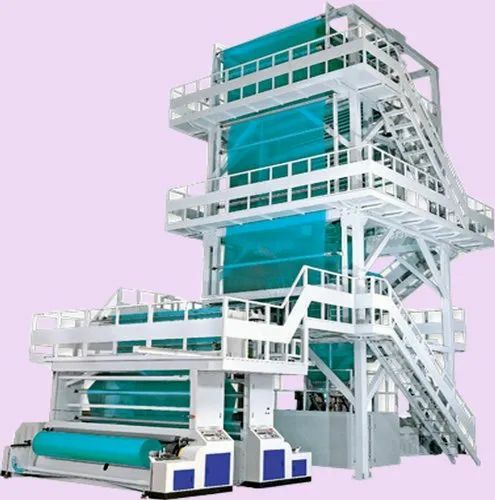 Two layer ABA Die blown film machine is an economical solution to create moderate barrier films for shopping bags, crop covers, carry bags used in textile sector, etc. It consumers low power and when it comes to return on investment, packaging industry can made good and fast profit. Similarly, two layer blown film line materials can also be produced from this single plant. Co - Extrusion Blown Film Machine with the best combination of technology and performance. These low investment, power efficient, high - speed plants can give processors the competitive edge and quick return on their investment. Co - Extrusion Blown Film Machine has a great demand in global market for its wide range of packaging products that can be produced from it. Two layer ABA Die blown film machine is an economical solution to create moderate barrier films for shopping bags, crop covers, carry bags used in textile sector, etc. It consumers low power and when it comes to return on investment, packaging industry can made good and fast profit. Similarly, two layer blown film line materials can also be produced from this single plant. Two Layer Blown Film Extrusion Lines with the best combination of technology and performance. These low investment, power efficient, high - speed plants can give processors the competitive edge and quick return on their investment. Twolayer Blown Film Line with the best combination of technology and performance. These low investment, power efficient, high - speed plants can give processors the competitive edge and quick return on their investment. Twolayer Blown Film Line has a great demand in global market for its wide range of packaging products that can be produced from it. Two layer ABA Die blown film machine is an economical solution to create moderate barrier films for shopping bags, crop covers, carry bags used in textile sector, etc. It consumers low power and when it comes to return on investment, packaging industry can made good and fast profit. Similarly, two layer blown film line materials can also be produced from this single plant. Looking for “Twolayer Blown Film Machine”?